Today is the deadline for filing your 2012 tax returns. We know from a survey conducted this month that 56% have a negative reaction to doing their taxes while 34% either like or love doing them. (See also an interactive that shows you responses from people we polled). 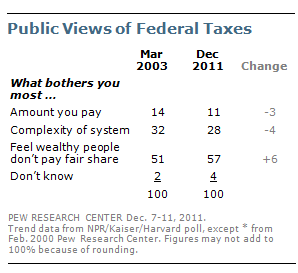 In a Dec. 2011 survey, we asked Americans a different set of questions on how they felt about their taxes and found that public dissatisfaction with the system had grown over the past decade. But the focus of the public’s frustration was not how much they themselves pay, but rather the impression that wealthy people are not paying their fair share. The number of Americans who felt they paid more than their fair share in federal taxes dropped significantly over the past decade, from 55% in 2000 to 38% in the 2011 survey. 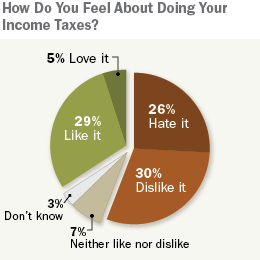 About half (52%) said they paid the right amount in taxes. Yet at the same time, fewer saw the overall tax system as even moderately fair (43%, down from 51% eight years earlier), and roughly six-in-ten (59%) said that so much is wrong with the tax system that Congress should completely change it. The sense of unfairness centers on the perception that wealthy Americans are not paying what they should be; 57% say this is what bothers them most about the tax system, while half as many (28%) point to the complexity of the system, and just 11% say that the high amount they have to pay is what bothers them the most.